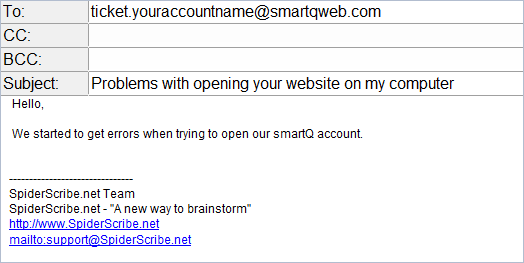 External Access allows people not registered in your smartQ account to add tickets (through email or an external form). Those External Users (also called here Clients) can access those tickets through a simplified interface, and track their progress, without going through any registration process. 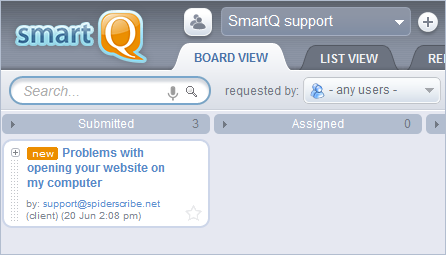 This allows you to use smartQ as a help desk, customer support, etc. You can enable External Access through the "options" menu on the top (limited to Administrators only) by selecting the project the external tickets will be posted into. 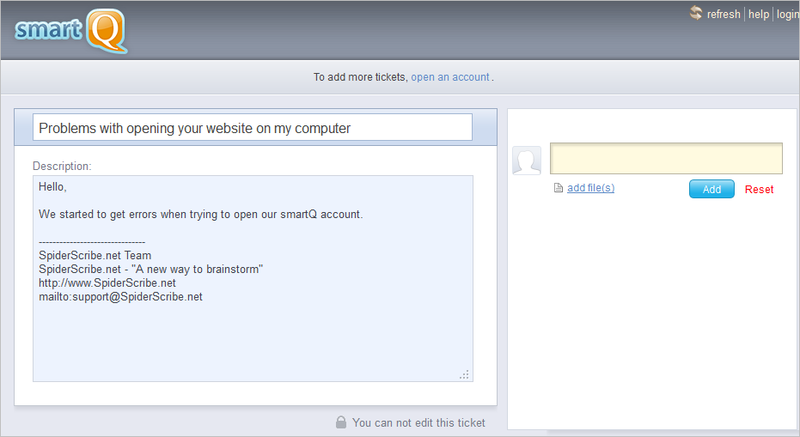 You can also email tickets into any other project, not just the default one. To do that, you simply have to send the email to the specific project email address located on project's Settings > Project Info screen. When a client submits a ticket through email or external form, he/she gets an email notification with the link to the ticket view (via a simplified smartQ interface), where the ticket progress can be tracked. 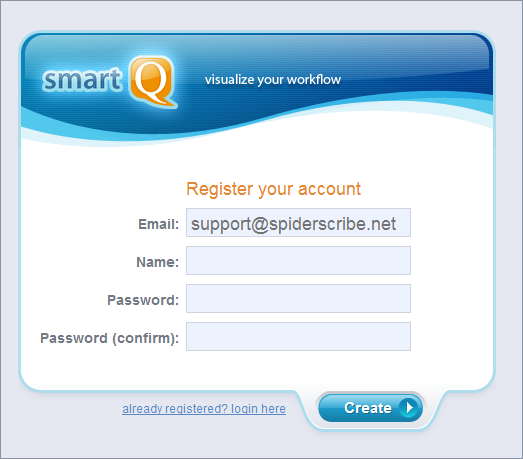 Registered smartQ users can see this ticket in their full-featured smartQ interface. Below is the description of all the steps involved. 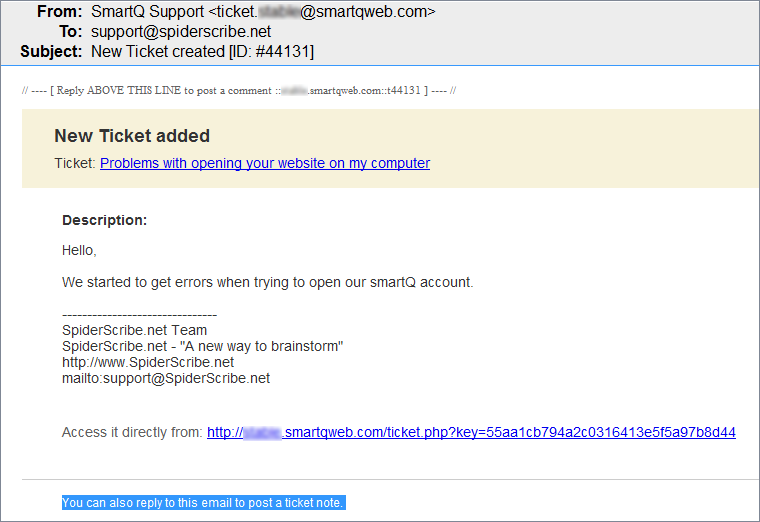 The ticket appears in smartQ inside the project you specified to "catch" those external users emails. Do not share the link from the email with other people, unless you want them to have access to the ticket. Any messages posted to the ticket through this link will be assumed coming from the Client that created the ticket. If the person creating a ticket through email (or external form) is a registered, regular smartQ user, those tickets will be placed into a project defined in Options>Main Settings [ read more ]. Clients can post his/her own messages through the simplified interface or by simply replying to the email notifications (and just manage the communication through emails). Clients can not see the workflow setup for their tickets - all the stages it goes through. They can only see the tickets either as Opened or Closed. A ticket is considered closed when it is moved to the last column in the main interface - the Client gets an email notification about it. A Client can also close the ticket at any time (but he/she can not delete a ticket already submitted). The ticket can be also re-opened - an email notification will be sent to the Client about that too. To post tickets to a specific project via the form, you will have to copy the form source code and place it on your website – check the source code for the commented lines that contain this functionality. Registered Clients can also open new tickets directly through this interface, using the "add ticket" button on the top right – that gives them the third way to create tickets. As with any other tickets, replying to an email notification from your email client will post a note with that email content into the ticket. People not added as registered users in your smartQ account (called External Users or Clients) can submit tickets to your smartQ account through email or external form if you enable the External Access. 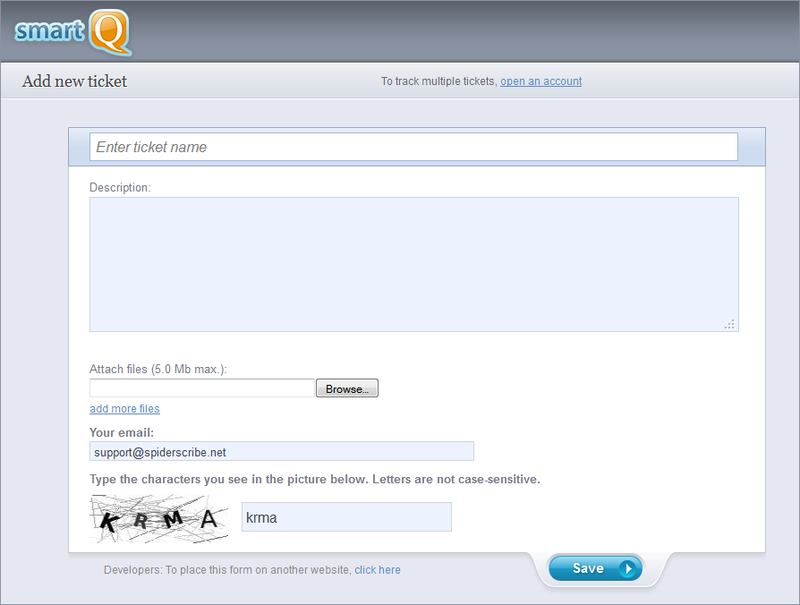 External Users (Clients) get web access to their ticket through a simplified one-page interface, while smartQ users can see them in the full-featured interface. Communication on this ticket can be managed through the web interface or through emails. 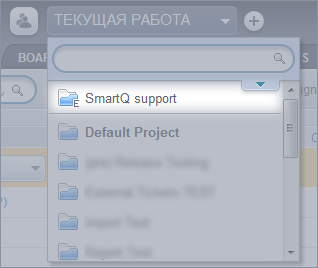 The ticket is closed when the Client closes it or the smartQ user moves it to the last column in the Board View (last stage). If the Client (with the same email) creates additional tickets through email or external form, he/she is offered to go through a simple optional registration, after which they become Registered Clients and gain access to all their tickets through one simplified interface. 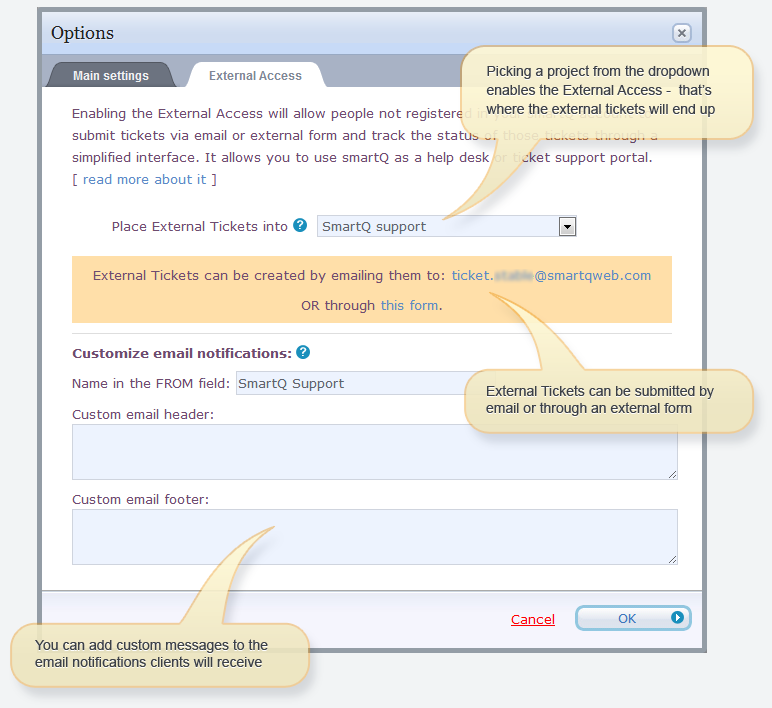 External Access allows you to use smartQ as a platform for managing a support desk (issue management, bug tracking, customer support, etc).